Breakout systems like this are always in great demand. It is quick, easy and with a proper use has a true winning rate of over 90%. Currency pair: GBP/USD, EUR/USD - tested. Other pairs may also be used. For this Forex system to work properly a trader needs to know the basics of identifying swings high and low, rules of drawing trend lines, plus be able to use Pivot Points. These are very simple things we believe every trader should know. The Entry is done on the break of either one of the trend lines and is immediate without waiting for a current candle to close. 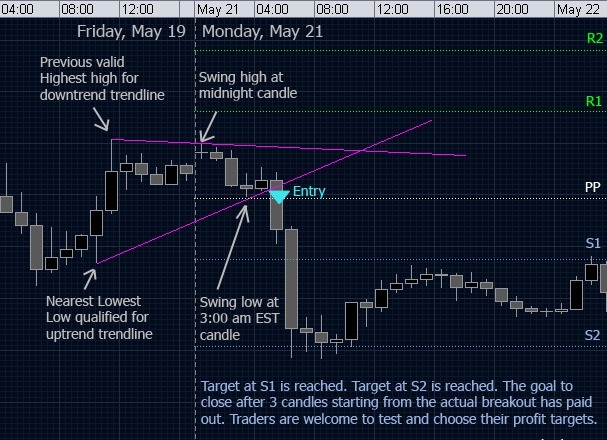 A protective stop is placed just above/bellow the candle that broke through the trend line. Usually the whole action is unfolded within the next three candles (count in the candle that had violated the trend line but only if it closed on the other side of the trend line). So, after the actual breakout we have 3 hours or 3 candles to trade, after that we will exit with whatever profit is made.